By the title you can see what exactly this blog post will be about. This week I will be sharing my journey through encouraging words from when I officially resigned from my teaching career and the steps I took in the process. Today's post however will be one that will go into deep discussion about how to know when it is time to quit. I am trying to keep it as personable as I can while also keeping it professional. Before I begin let me share a little bit about me and who I am, especially for those of you who have not gotten to know me through this blog or my YouTube channel. Sometimes quitting a job is scary and we look for outside encouragement to know if we are making the right decision. The one thing I want to tell you is that if you stumbled across this blog or find yourself compelled at the topic, then you are already contemplating a big move in your life. I commend you. I commend you for possibly kicking yourself out of your comfort zone, even if just in thought at this very minute. I however, have been contemplating this move for a couple of years. Emotionally, maybe even longer but I tend to try to squeeze the best possible scenario out of a situation before I simply throw in the towel. With the exception of my first career, I have a pretty long track record of sticking to a career path for a great length of time. When I graduated high school I graduated with my Cosmetology license and went to work doing hair within three days of graduation night. I stayed in that career for a year and 10 months. I was bored within it after the first ten months and stuck it out for another year before making a move. I then moved into retail for a locally owned Western Wear Retailer (BIG in the area I lived in) and grew within that company for nine years. At the end of my nine years it sold it's business to two separate entities ~ and I chose one knowing regardless I wouldn't be returning to work after the birth of our twins in a few short months after the transition. I stayed home with our toddler at the time and the babies for two years and four months before beginning a new career as a preschool teacher at a local church. It was there that I remained until just recently ~ 13 years later. So, as you can see, I am not a job hopper nor do I believe in just quitting a job because it is hard. I do not believe in quitting a job simply because things do not go your way. In fact, those are both reasons to stick it out! Seriously! I also do not believe in quitting your job simply because someone doesn't like you. Again reasons to stick around. Why? Because those kind of situations give you life lessons! Those situations bring you out of your comfort zone and grow you as a person. Those situations indeed grow you to become a better person than you were before. 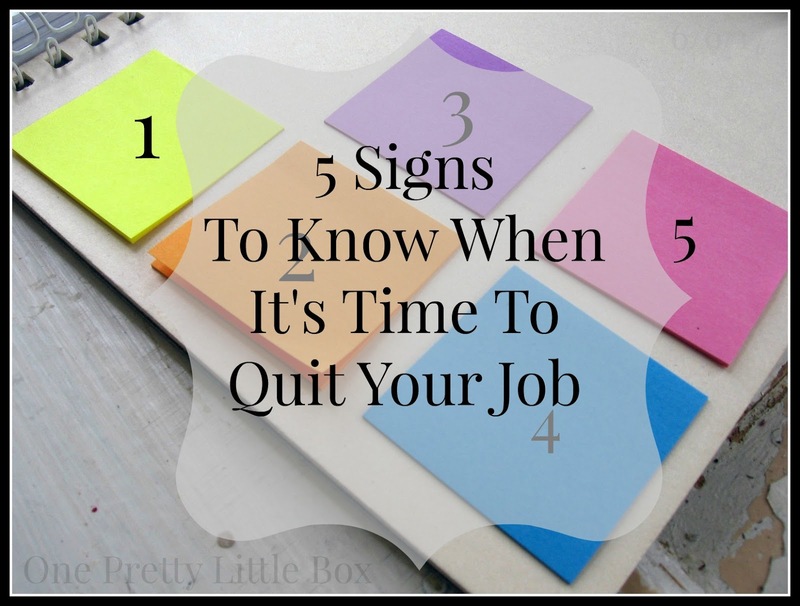 Now that all that is out of the way, let's talk about 5 signs to know if it is indeed time for you to quit your job. Ready? I know that sounds silly, as many people are always looking forward to the weekend but let's be serious for a minute! Weekends are fun, but if we are truly working in a career that we love, that inspires us we also look forward to workdays. Many of you have heard or read me saying that Mondays are my favorite day of the week. Sadly, it has been a while since that truly has rang true in my heart. In fact, I have become a member in the "I hate Mondays" club. Mondays though usually are my favorite day of the week simply because it is a fresh start, especially during the school year because it applies to our whole family! I tried to always make Mondays special with breakfast, supper, and even either an activity or something to make the kids learn to love Mondays too. I always thought it was just a perspective that needed to be fixed ... that is until I found myself hating them. And then honestly, I have been beating up myself for hating them making it even worse! Weekends are great, but Mondays are not meant to be terrible! That's right. *sigh* I would spend a good two hours trying to get my mind and heart ready for the day and then ... have to continue it every couple of hours just to get through the day. I have never had to invest that much energy in myself in my life just to get through the day. The whole last three months I would pull up, and sit for a minute or so just trying to muster up the courage and strength to open the door to my Explorer so I could walk in. I faked it hoping I would fake it enough to fix my heart and yet ... I never did. I tried. I tried to fake myself out and really was just left empty. If you are feeling empty, and like you are having to "fake it until you make it" then maybe, just maybe it's time to move on. Ever feel that way? I have heard mom's say that and as a mother/wife I have never felt that way. However, I have felt that way for at least the last six months to a year at work. I already felt alone, like I had no support or even a listening ear that wouldn't gossip that I felt utterly desperately alone as it was. Except for the times when I was teaching the children either alone or with a substitute. Those times I was able to be myself freely and not have this oppression just lingering over me. It came down to me just trying to "tough it out" and go into survival mode and if you know me I HATE that feeling! Life isn't meant to simply survive yet I was barely hanging on for that. I truly felt lower that I have in my entire life yet I was "hanging on" waiting for an opportunity to be presented to me through all of my job searching. Now I have to say that there was also added pressure from my own personal home life that did not lend help at all. Had things been stable at home then maybe I wouldn't have felt as down as I was. I don't know about you, but anything that makes me become bitter and irritable with my family (outside of normal family irritations) then something has to give. I have been busy before and at the end of every school year I had always felt relief because being a working mother and wife sometimes my family got my left overs. But one thing is for certain. I did not take out my work frustrations on them ever. This year, it was often. One of the most important years in our kiddos school years (the Senior because it was her last, and the twins because they were Freshmen and it was their first in high school). No job is worth your peace of mind. I have spoken many times of how women are the thermostats in their home ~ they set the tone. If your tone is full of frustration, irritability who the heck would want to be around you?! I can tell you, I didn't even want to be around myself anymore and that is a scary place to be. I am the Positive Pollyana and I can find the good in every single thing ~ most times. If I have to spend a lot of energy trying to find it, I will. And I don't give up easily. But when I have to dig every day to just find one thing, and that one thing is the same thing (in my case it was the children and their families of my classroom) it even looses it's influence. No job or workplace is perfect by any means because it is ran by humans and well... humans make mistakes. But, humans also make the difference in the atmosphere and the outcome. So, make a list. Make a list of the positives and make a list of the negatives. If one far outweighs the other then you have your answer. HOWEVER, just like above some negatives can be changed by your own response and trouble shooting. When those no longer work, and there seems to be no hope for anything better, it's time to go. Gosh this post was a downer to write! I knew I wanted to share some of my thoughts with others because sometimes you need to be told it is OKAY to leave a workplace you are no longer thriving at. Sometimes you need to be told you are WORTH more than some people will give you value for. Your happiness in the work you do is CRUCIAL to your success. And more than that your dignity is important to guard and should not be left in the hands of others. EVER. If any of these rang true for you, please consider your options. Start putting your applications out there, and dig deep into your personal desires. What is it you can see yourself doing? Do you maybe need to stay in the same career line but change workplaces? Are you like me and need something new? As much as I loved and valued teaching, it was just time for me to go. I had a vision and it came into fruition. I also had goals and visions for more that just were not feasible nor supported where I was working. In the end, I had been putting applications out by crazy numbers on the regular, contacting people that I knew who were in the field I was desiring to go into and even people who were not but might have an inside scoop. I am excited to say I am now awaiting my new career to start and enjoying a few weeks of my last "summer break" before my new adventure begins! Thank you for your support and kindness! I will link below the YouTube channel video that I made to go along with this post. And again, hang in there. If you can't be the difference, make the difference! Product Reviews & Business Inquires sckakame(at)aol(dot)com Please include a glimpse of your interest in the subject line.